Southeastern College is situated in the heart of Pasay City . It is positioned in between Libertad Street and Buendia. It may be accessed through two major thoroughfares, Taft Avenue and Burgos Street . 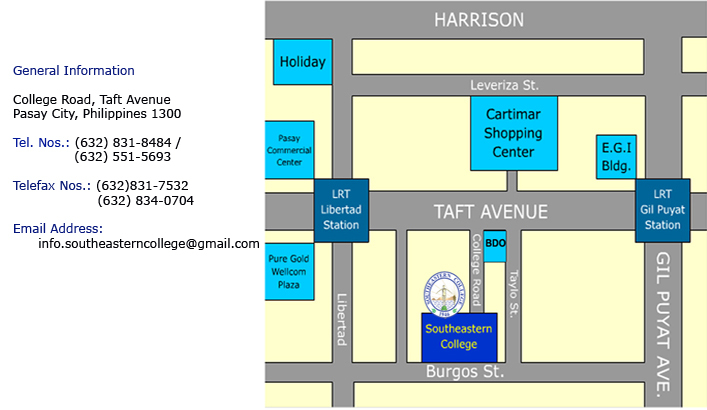 The main entrance of the College is located at the end of College Road , which intersects Taft Avenue . The alternative entrance is at Burgos Street . Southeastern College is accessible to commuters, as the Libertad and Buendia LRT stations are conveniently located near SEC. PUJs also pass through Taft Avenue .